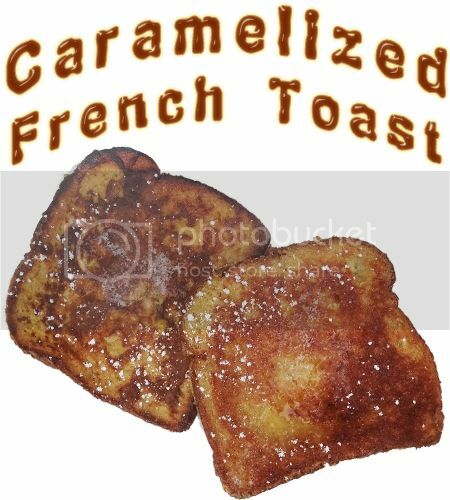 Scroll Down to see the Amazing and Super Simple and Really, Really Delicious Caramelized French Toast Recipe Below. Category for many of the Personalized Presents for Mothers. Matching Greeting Cards to make it even more special. INSTRUCTIONS here, below and included in many of the Product Description on How to Make Personalized Mugs. Easy Photo template to Upload YOUR PHOTO of the Kids or Your Beautiful Mother. Change the TEXT too in the Text Box Templates. 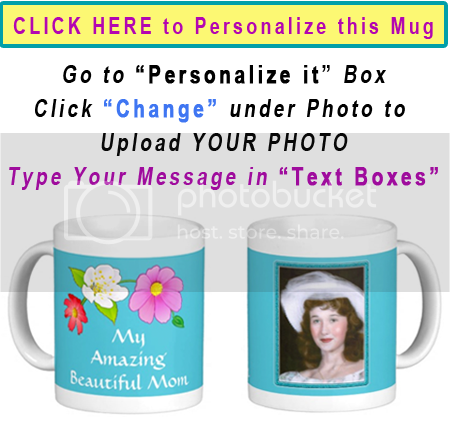 Under the “Personalize it” section, Type in YOUR MESSAGE to the right of the Custom Mothers Day Gifts. Click the tiny blue word “Change” below my temporary image and follow prompts to ADD YOUR PICTURE. Call Linda to make color and design changes for you. Here is a Card designed to go with the Mug for Mothers above. She will love the sweet little old fashioned girl with butterflies. Type in YOUR MESSAGES to Mom in the 3 THREE Text Boxes to your right of the Mothers Day Cards or give for any occasion because you choose the special messages. 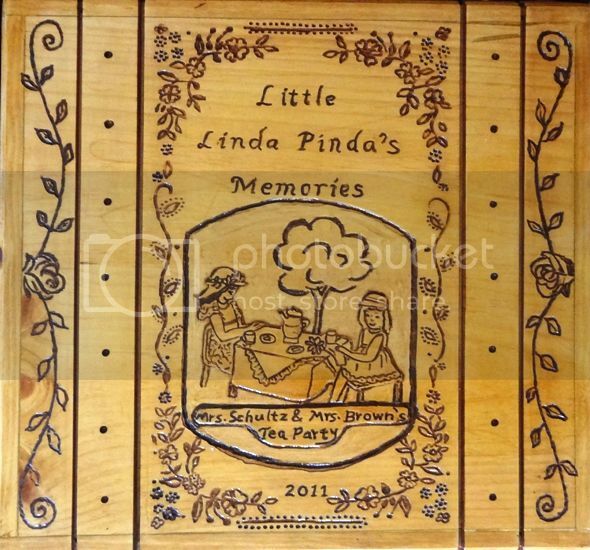 Pretty Gifts for Mothers by Little Linda Pinda Designs. 100% Love it Guarantee for 30 days. No reason needed. 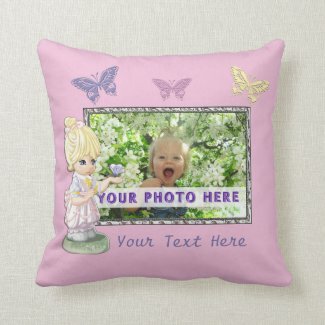 Zazzle is confident you will love the gifts because only 1% and less ever return their Zazzle products. I even read one person’s review that she had to return her wedding invitations because of changes they needed to include. She was so happy with Zazzle accepting the return even though it was a change on their end. My Mom Singing In the Sweet Bye and Bye Video Below. You will Love it. Hear my lovely Mom Sing “In the Sweet Bye and Bye Hymn” YouTube Video. You can also see the gorgeous Memory Boxes she made for the grandchildren and great children. Hand carved along with the brick patio she built. Wow, Mom! You are INCREDIBLE and at 82 years young, you are so Beautiful and you always amaze me. It is so simple to make and your mom will love it. My son-in-law called it “Amazing”. Mothers Day Presents that are fully and partially customizable to personalizable gifts with your own special message to mom. 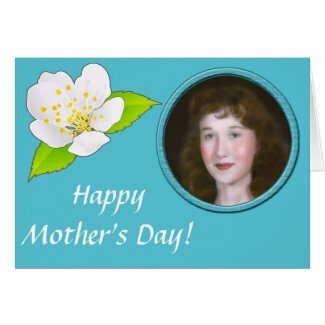 Send Mothers Day Cards Online with the easy “Personalize it” section. Just type in your NAME and CHANGE MESSAGE if you desire by Typing in YOUR TEXT in the Text Boxes located below the “Personalize it” section which can be located to your right of the gifts for mommies on the product page. 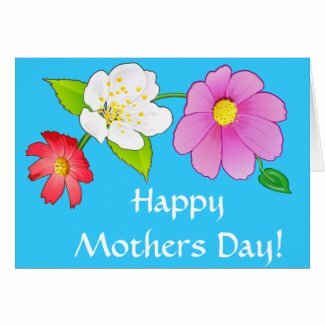 You can put Your Own Photo and Text on this Mothers Day Cards with Photos and Your Message. 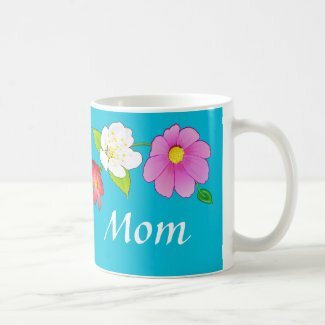 I made this Mother’s Day Mug and Card for my mom with her photo but you can easily add your own customization. 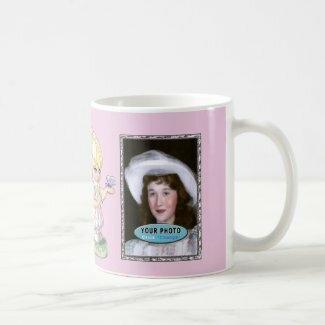 After you click on this Mug, On the right hand side of the product on Zazzle, in the “Personalize it” Box, You can CLICK the little blue “Change” which is located underneath my mom’s photo to Upload YOUR OWN Photo and on the Left Side of the mug, in the “Personalize it” Box, you can Type in Your Special Message to your Mom, Grandma Mimi, and Gifts for Stepmom etc… I put it into 3 separate Text Boxes so I would get the alignment that I wanted. You can see more instructions on how to make custom coffee mugs in the product description. ADD YOUR Children’s Photo or a Photo of Your MOM, like I did. The Text is Changeable and the Photos are too. Or you can buy Cards and Gifts that don’t need any customization. Mothers Day Gifts that can be delivered right to her home. I love the convenience of sending my gifts from Zazzle right to the recipients home. You can even fill out a little Gift Note too. 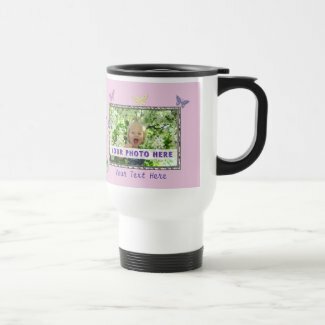 You can create this Coffee Mug Personalized with Photos of Your Family, Mom or Pets. CLICK HERE See this Mug. To Personalize it., go to the area on the right of the Product. 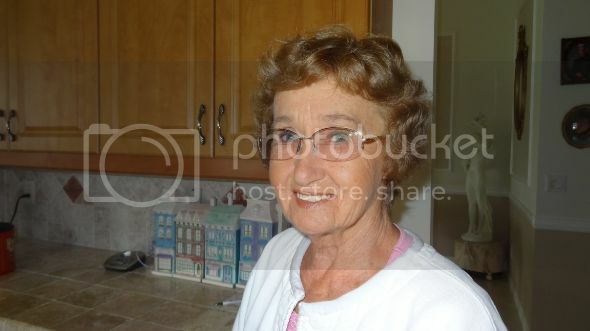 Click the little blue “Change” underneath the temporary photo of my mom. Click “Upload New Images” and or “Select 1 image to Upload” YOUR PHOTO on the Right Side of mug. In the same “Personalize it” area, Type in Your Special Message in the Text Boxes. You can use just the 1 Text Box if you wish. Wouldn’t it be fun to give mom a Matching Mothers Day Card to go along with the beautiful Hawaiian Mug design? What a memory that she will cherish for a lifetime. My mother helped me enhance this design from Vecteezy.com. We took the separate flower pictures and added the vines and enhanced the flowers. She loves creating beautiful things as much as I do. Happy Mother’s Day Cards. You can Send Mothers Day Cards Online too along with the Matching Mugs below. Here’s the Matching Coffee Mug. ADD YOUR OWN PERSONAL Special Message to Anyone. Beautiful gift for daughter-in-law, stepmother gifts, sister etc. 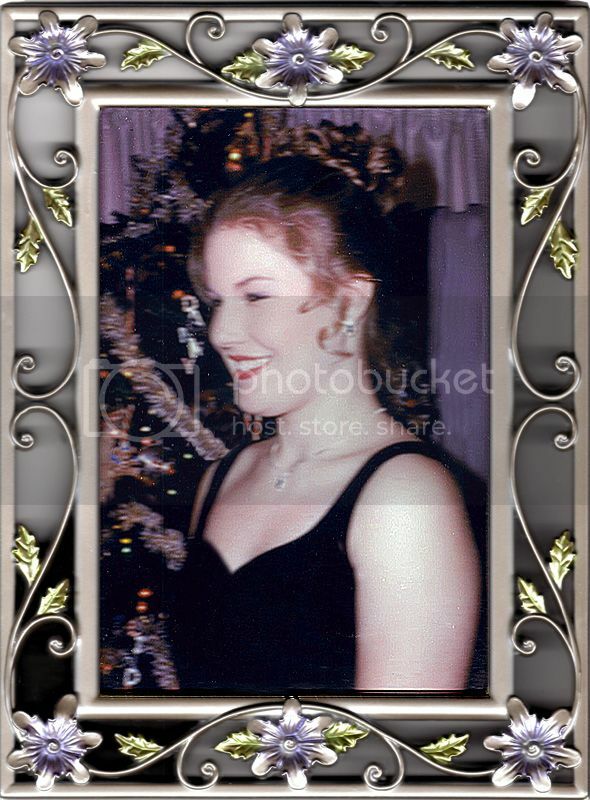 I love the photo of my mom when she was only 18 years old. For the first time in my life, I finally saw the resemblance that I have to my mom. People tell us often that we look alike and neither of us see it, but I did today. “In the Sweet By and By Hymn” YouTube Video Sung by My Mom is below. I hope you will enjoy listening to it. What are some ways to honor your mother to show her just how much you love and appreciate her? To me the best way is from your heart. Some of the most touching gifts I’ve ever received or given were from my heart to my mom and dad. Photo graphics by http://www.Vecteezy.com and Enhanced by Little Linda Pinda. In the Sweet Bye and Bye Hymn Video Below. My mom is not only beautiful but she is one of the smartest women I know. I always tell her “if I was half as smart as you, I would be so lucky.” My mom is also an inventor who never sold any of her incredible ideas. She even made a snuggy-like blanket with arms in the 1960’s similar to the one that became soooo famous. One of her favorite sayings is “Necessity is the Mother of All Inventions.” If my mom needs it, she makes it. She has created so many cool things it is incredible. Even at 82 years old, she is still fixing things, making things, working on her yard and helping me create designs for my Zazzle products. This is One of the Songs She would Sing at Nursing Homes. She Sings Like an Angel. People loved hearing her sing the good old hymns. My mom was such a blessing to so many people. From the time she became a Christian, she dedicated so much of her life to reaching out to others. She raised us going to the Veteran’s Hospital to visit and sing, Nursing Homes, Church and I remember the days going to downtown Milwaukee when they would minister at the Rescue Mission. Mom and Dad not only reached out with the Word of the Lord in little sermons to those who couldn’t get to church but also in Love. Everyone loves her hugs and warmth. Her Bible Study group will still go out to bless people at Nursing Homes. My mom lost her beautiful singing voice due to a bad virus at the same time my dad passed away. I am so glad I have so many of her songs on tapes and CD’s. You will love In the Sweet By and By Hymn song with a country flare. The BEST Presents for Mothers are created with Love! The Best Gifts for Mothers are often Free. I was so touched when our pastor read this letter my daughter wrote at church. I was totally surprised but most of all touched. I still tear up when I read this. 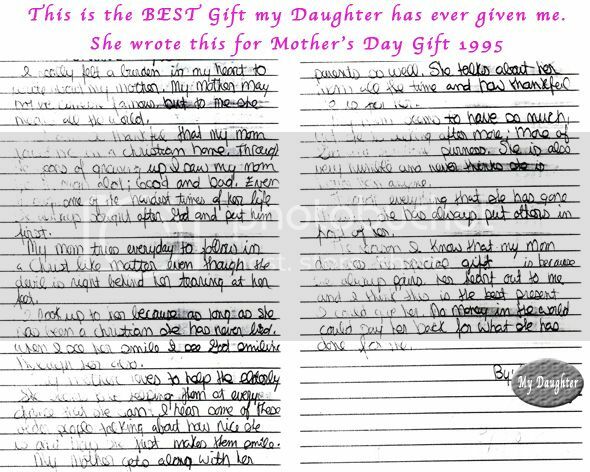 Writing your mom a letter from your heart will most likely be the best gift she will ever receive from you too. Telling your Mother often just how much you love her and appreciate her will mean the world to her. If saying the words are difficult for you, try writing them down. If you start saying, even just a few words of love to your mom, you will see that it gets easier and easier. My mom was raised, where “I Love You” and Hugs didn’t happen much, only when she was really little. When she had kids, she decided to break the cycle of not showing much affection. My mom hugged us often and told us that she loved us often. I consider our family to be a very demonstrative and loving family because of this. My brothers became VERY loving fathers and husbands because of being raised with so much love. They all were involved in caring for their children too. One of my sister-in-laws told me she didn’t show affection until she met my brother. I would never have know that because she is so loving now. I just made this for my Daughter and her family and her husband said it was Amazing. I changed my mom’s recipe slightly. It is so good you won’t even need syrup because of the sweet caramelized sugar grilled on top. I would still offer it though because most people still put syrup on it. Syrup or Powdered Suga rif desired (this is so delicious, I eat it as you see it and my husband adds syrup). Whisk ALL ingredients together in a wide shallow bowl (except Bread and Butter). Get your griddle fairly hot on medium heat. Melt and Sizzle the butter on the griddle or large pan but don’t let it get brown. Dip Bread in the Mixture. The longer you leave in the bowl the wetter it will be. If you are using fresh soft bread, just dip it and remove when totally covered. If you are using stale bread, you may want to soak it a bit longer. Place the Dipped Bread Slices on the Griddle or Pan. Sprinkle Sugar evenly on the French Toast while grilling. When golden brown on the one side, lift the bread and put another dab of Butter and turn the bread over to Caramelize making sure it doesn’t burn (you may want to turn the heat lower to caramelize slowly). When the sugar coating is golden brown, Remove and place the sugar side up on a plate and put another dab of butter on top. I eat it just the way it is and my husband adds syrup. Makes 12 Slices of French Toast. Using a large 2 Burner Griddle is much quicker because you can make 6 Slices at a time. I can only get 3 Slices into my round pan. A square pan helps. It is very important to put butter on the pan again before you turn the sugar coated side down to grill. My mom raised us on this really yummy splurge french toast recipe. Golden brown caramelized french toast. So nicely sweet, you really don’t need any syrup but my husband does. This photo was taken of my Mom shortly before she left our Florida home to go back to her home up north. She is 82 and still Amazing and still Beautiful. My mom loves the Lord with ALL her heart and soul and is such a wonderful Christian example to us. She spent decades of her life ministering to people in hospitals, nursing homes and church. My mom, dad and gramma, Dee Dee used to go to nursing homes on Sunday mornings to share a church service with people who couldn’t get to church. They shared a sermon and sang good old hymns along with hugging and loving them. When I was a teenager, my mom would take me to the VA Hospital and Nursing Homes to visit and sing. My brothers, along with their wives and I would also sing. I am so grateful that our mom showed us this kind of love and compassion and how much it effected others lives. Certified GENIUS! She is the smartest and most talented woman I know. I always say that if I was half as talented and smart as she is I would be so lucky. She is creative too. On the video, I show the Log Home Mom and Dad built along with the 25 Foot Fireplace she built. My mom is incredibly talented. She has invented so many products, unofficially. She came up with and made for herself, products 30 to 40 years earlier than the person who actually patented the same products. One quote she loves to say is “Necessity is the Mother of All Inventions.” (originally quoted by Plato). Mom and Dad built so many projects including building a 25 foot high stone fireplace and did a lot of work on their log home. My dad handed mom the logs and she would place them and mortar the stone into the fireplace when she was around 60 years old, even at the top at 25 feet. I sure wouldn’t do that. At 80 years old, she insisted on helping me paint our home we had just bought in Florida. When I just didn’t want her to climb on a ladder, when I left the house for a few hours, I would come home to her finishing painting. She kept telling me she is so careful on a ladder and never had a problem while on a ladder but I was still afraid to agree to it so she would paint when I left. We both enjoy remodeling and renovating property. Mom made this gorgeous Wooden Memory Box for herself and my dad with memories of special times in their lives carved into the box. Then she went about to create one for every one of their grandchildren. I must admit that for years I was envious and gently let her know that I wish I had one. 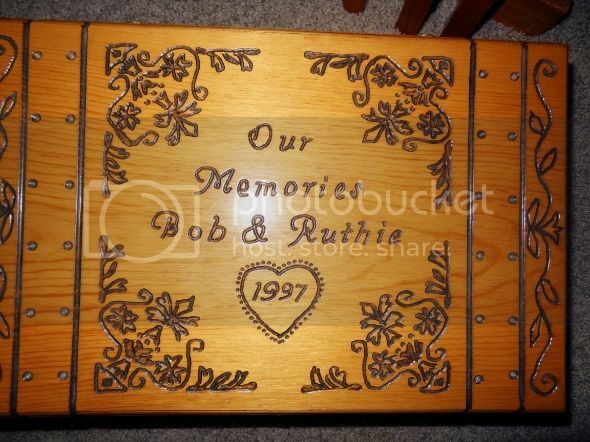 All of a suddened, she presented the most amazing hand carved memory box of the special times in my life too. I will FOREVER CHERISH my memory box. Here is the Memory Box Mom Made for Me. I LOVE IT sooooooo much. Thank you Mom. On all sides of the memory box she carved memories of my life. The front is the memory of us having tea together as Mrs Schultz and Mrs Brown when I was a little girl. How to Say Thank You to Your Mom. No words can really totally express your feelings for just how thankful you are to your mom for standing by at every moment and ALWAYS being there no matter what. Some of the gifts I’ve created give you the chance to add your own words. Mom’s need to be appreciated and love to hear just how much you love her. A soft loving letter will be a gift she will never forget and she will cherish forever. I found all these recipes for Fabulous French Toast on the super popular Pinterest site. Thank you for visiting our Personalized Presents for Mothers article. Please CALL or TEXT me, Linda if I can help you create something special just for your mom. I love making people happy and I love to imagine your mom receiving her custom Mother’s Day gift or any special occasion. 239-949-9090 This is the Fastest and Best method of contacting me.